It’s surprising how many web apps are out there that set out to accomplish growth and mistake activity for sustained progress. Perhaps they get some press but then lack traction. Why? Because they don’t get the ‘how’ right. It’s a lot like producing a movie. You can get a great actor and pull off a movie, and there are thousands of B to D grade movies out there. Or, you can get a great actor with a fascinating story, smart script, talented director and sophisticated editor…it’s the difference between a blockbuster or a straight-to-DVD production. Dropbox should be studied — in the way Google, Facebook and Craigslist are studied — on how they’ve built their user interaction and design. I’ll show you a few screens to show what I mean. Their home screen is as simple as Google. 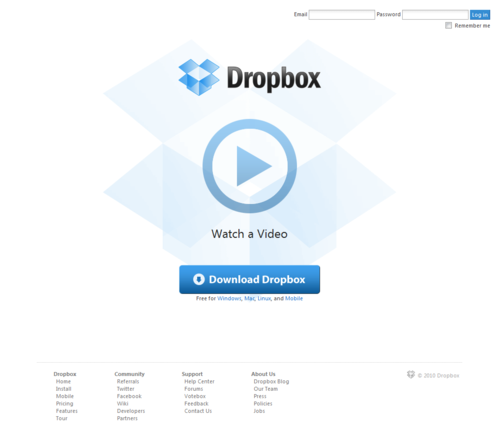 For Dropbox, you either login or download, or watch a video to understand how it works. That’s it. Less is more. While a TechCrunch or Mashable article can spike signups for a web or phone app, sustainable growth is only possible if the app has high utility (where it ‘infects’ their life), convenience, and engagement. DropBox is brilliant in this screen. They very clearly outline steps they’d like you to take, and make the most prominent image a ‘thermometer’ infographic that reflects something you can earn, 250MB of storage space. That’s a smart giveaway because it costs them practically nothing (assume most people don’t even go up to 2GB), yet has high perceived value for first time users, and it reminds users they may want more storage space (teeing up an upgrade later). My only suggestion is they put a time limit to get that upgrade. Every time I add the app to another computer, they know it’s me, and they ask if I’m ready to upgrade. Very simple choice…showing me where I’m at now. When I install the app, that’s a relevant contact point, because as I add it to other computers, ostensibly I’ve likely increased usage. I don’t know if it’s the case, but I’m sure upgrade messages will come as I approach 2GB. This is great UI X smart business sense. If you’re wondering if a great designer or user experience professional is worth the investment, just look at this example (and dropbox’s traction) as evidence. 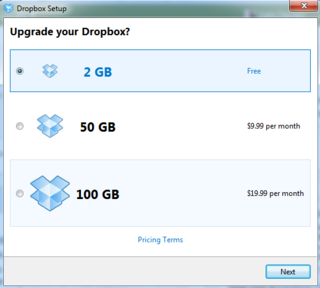 DropBox is a killer app. Why because it is simple to use, simple to understand and does what it is designed to do. Sounds easy but it isn’t is it or many more companies would be getting it right. Using Dropbox for a business case study I am doing and found your blog..great blog your in my RSS now..